Curious to find out why writers who already have a paid market for their work would also spend hours creating and maintaining travel blogs, I decided to put the following questions - Why do you think travel writers blog? What made you start a travel blog? - to few travel writers. 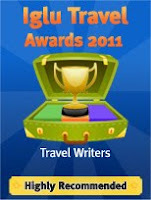 * Writing a travel blog allows freedom of expression and ideas not always encouraged in newspaper and magazine writing. * A Travel blog provides a storage facility for travel notes. * Writing a travel blog provides connection with your readers. * Writing a travel blog is like creating a travel library. * Writing a travel blog provides exposure and some financial rewards. Read the full post Travel Writers - Why Do They Blog? to find out which travel writers I asked and what they had to say. So why do you blog??? 'Travel Blog of the Week' will be back next week. The blog, I think, is a place for those random observations, thoughts and ideas that are so much a part of travel, but which rarely receive an airing elsewhere. Random observations - that's a great way of describing it. And when it comes to travel and writing, it's not all about the money in the end...it's about the enjoyment and satisfaction of sharing your journeys with others. I believe it would be beneficial for us from the serach engine optimization point of view if we did a BlogRoll Link Exchange.